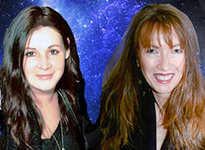 With your ruler (Mars) exalted in Capricorn and conjuncting Saturn this month. You should be thinking more about taking charge of your life and achieving your goals and ambitions. 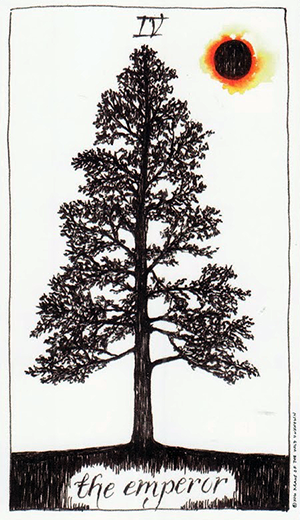 This is the Wild Unknown Tarot’s version of the Emperor card, in this case a stark and mighty tree stretching high into the heavens. Notice the New Moon in this card too: it’s in your sign this month (on the 16th) conjunct Uranus, the planet known as the great awakener. This card symbolizes worldly acclaim and ambition. No matter how high you want to climb, you can know that there are possibilities available to you if you only you set your sights on pursuing them. You may be asking yourself whether you want to be a small fish in a big pond or a big fish in a small pond. It’s all about gaining perspective and establishing priorities. As the Emperor also relates to the “Laws of the Land,” some of the less pleasant manifestations of this card include things like being on the receiving end of legal or professional disciplinary actions, dealings with the IRS or government, or having to deal with an oppressive boss or coworker. The message behind this card is one of taking care of business. Hard work, perseverance and determination are all required: nothing will come to you through sheer luck or wishful thinking. It’s not the time to be passive or wishy-washy. It’s all about stepping up and taking control of a situation that requires a firm hand and authoritative presence. With your ruler (Mars) moving through its polarity sign (Libra) this month, you may need to look at things from a different perspective. You might feel like you’re stuck between a rock and a hard place, or you could be struggling with a decision that’s not going to be easy to make. Perhaps this is why you’ve held off in the first place, as the the Two of Swords refers to not just feeling torn between two options but wanting to avoid making a choice between them as well. 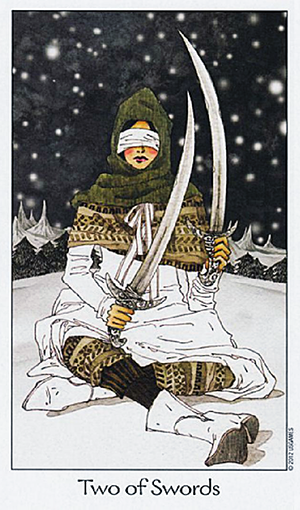 The figure in this card — from Rome Choi’s Dreaming Way Tarot — is blind-folded and holding up two sharp swords. She may be leaning towards one but she’s not taking any steps to act on it. In this respect the Two of Swords can refer to inaction and immobility. Sometimes this is due to fear: “What if I make the wrong decision?” But it’s just often related to a desire to not have to choose at all. Alternately you may have come to an impasse with someone and are actualizing this energy through passive resistance. This isn’t a better solution and it won’t solve anything: while you may need some time to pause and reflect, you’re going to have to take a stand whether you like it or not. The inertia that comes from choosing not to choose can prevent you from moving forward. It’s going to be critical to weigh your options, make your decision and then stand by it in the end. This month may see you taking steps toward leaving behind something that no longer sustains you. 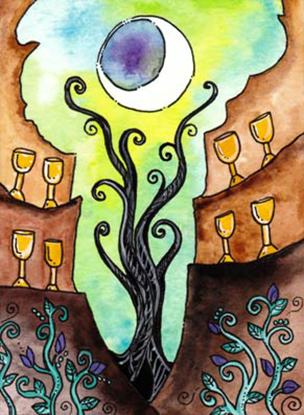 The Eight of Cups — this version from Dana Driscoll’s fabulous Tarot of Trees — refers to getting in touch with your values, which can be a painful process. It involves forcing yourself to face certain realities and walk away from something (or from someone) that doesn’t live up to them. On the upside it means taking the high road and making a transition. But that doesn’t mean it’s going to be easy. 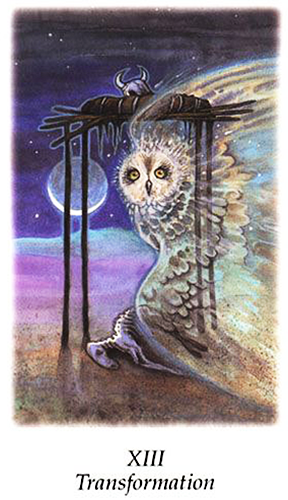 The Eight of Cups requires you to let go of something — a dream, a relationship, a set of goals, etc. — in order to move to that higher ground. 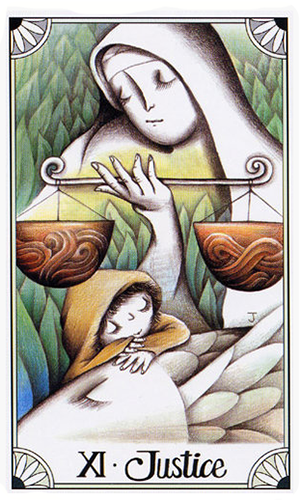 This is a card of transition, but unlike most, this one comes from conscious choice. It’s not a matter of the Universe throwing a curve-ball at you: it’s a decision arrived at though the realization that what once fulfilled you no longer does. You may feel alone or abandoned during this time — rejected by a loved one or peers. Yet it’s your own discontent that prompts you to “walk away,” rather than trying to keep up the pretense that those who let you down were ever truly on your side. This doesn’t refer to loss so much as it does to seeing things more clearly and then using that new-found clarity to head toward higher ground. Like the brightly shining crescent moon in this card, it’s about new beginnings rather than endings. You can see this card as an invitation to strike out on your own, follow your own path and pave your own way. 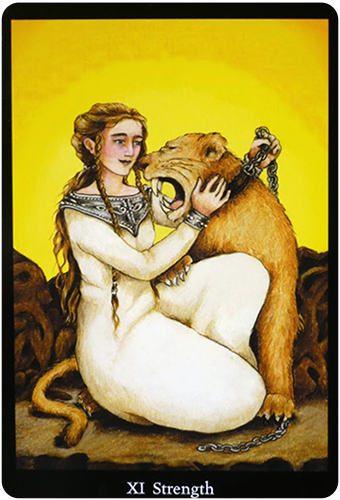 This month you may be called upon to tame your inner beast, meaning that if you feel your emotions rising and you know they may get out of control if you give way to them then you need to reign those emotions in and find another way to express them. On the surface you look happy and calm almost contented as if nothing can rattle you yet underneath a storm may be brewing. Be on the lookout for anyone trying to press your buttons to seek a reaction from you. This may be of paramount concern to you this month with the Strength card — this version from the Anna K Tarot — as your talisman. If you have been having trouble with someone and they know how to rile you then you need to be extra vigilant that you do not react the way they are hoping for. If you do you lose and they win. The yellow sky shows a prevalence of mental abilities today yet if your mind is too cluttered with many different thoughts you may not get to the gist of what you are wanting to know. The white dress shows you as innocent in some way… almost like a blank canvas waiting to see what sprouts forth. Whatever does come forth for you today you can be sure it will not be small. Today’s Venus / Jupiter sextile can bring out the kindness, warmth, graciousness and congeniality in all of us as we move into the final days of the year. No matter where you are in the world today, you may feel like Spring is in the air, as this transit moves in like a breath of fresh air. This is a gentle, easy-going transit that brings feelings of benevolence and goodwill to the forefront. 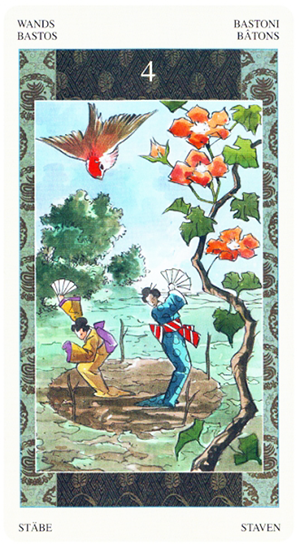 Today’s card — the Four of Wands from the Samurai Tarot — is all about reflecting on accomplishments and looking forward to where those accomplishments may lead. It speaks of rejoicing and celebrating — whether this means planning for a party or special event, or getting yourself out of the doldrums and washing away the blues. No matter what else you’re up against today remember to be grateful for what you have. It’s not the time to isolate or withdraw from social opportunities. Look around you and take note of all you’ve accomplished thus far. Chances are good there’s a lot to be grateful for and a cause for celebration right there in front of you. Today is a day for honoring the relationships you have developed with loved ones and family members. It’s a day for rejoicing and celebrating — whether this means planning for a party or special event, or getting yourself out of the doldrums and washing away the blues. This is a day or expressing love and affection for those who are there for you even when the going gets tough. 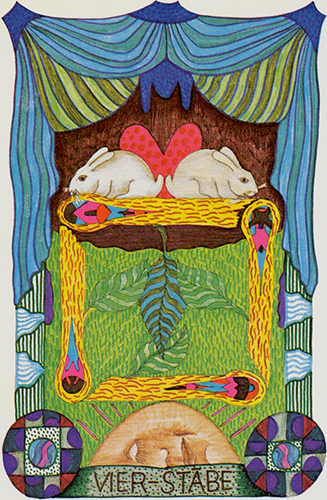 It’s a day for basking in the power of love — like the two bunnies in this card. This is a month of new thoughts and new ways of doing things. It is also a month for changing your thoughts and ideas on something. Notice the butterfly wings around the Sword — from the Miracle Tarot. Venus turns direct this month, bringing grace, harmony, beauty and love to the forefront. Even the sharp edges of the sword are not enough to deter the butterfly from being this near the blade. It is almost as if you can throw caution to the wind and say/do whatever you want. Well… perhaps not too much as Mercury is about to turn retrograde again. Your thoughts are pure and aimed single-mindedly at the outcome you desire. If you have any mental tasks to accomplish do so whilst your mind is highly alert and focused on what you want. The play of muted colours through this image give your clarity in anything creative you wish to succeed in alongside a transformative quality to the way they spring forth from your mind. The blade looks sharp but don’t be fooled as it will not harm you as long as you stick to your principles and deliver your words with care and grace nothing will stand in your way. With the Sun conjuncting Jupiter today, it’s a good time to count your blessings for the world you’ve created and the loved ones who surround you. You could be the recipient of good news, or an unexpected surprise; or you may celebrating an achievement that involves friends, family and those who’ve supported you along the way. The Four of Fire speaks of rejoicing in the moment and keeping things fresh and alive, all the while thinking about the future. It can be a joyous celebration, a gathering, a reward or surprise — the affirmation that all of your hard work has paid off and is now worthy of being celebrated. You could be planning a party or casual get-together; or you could be making plans to attend one on someone else’s turf. Either way, it’s a time for rejoicing rather than isolating or withdrawing from social opportunities. The Four of Fire can mark a happy occasion, such as an anniversary, engagement, wedding party, or the birth of a child. It tells you that “this is only the beginning” of something you’ve already established and that it’s bound to just keep getting better. 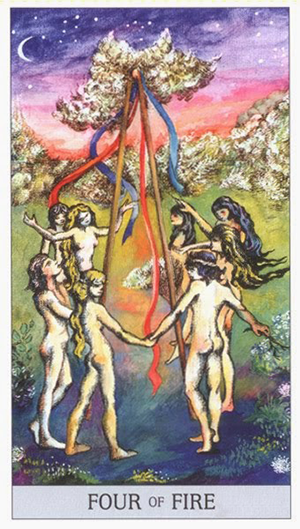 This card — the Japaridze Tarot’s version of the Four of Wands — heralds the completion of the first stages of a project and acts as confirmation that things are moving forward. It says that you are making progress, building on something that’s well on its way to being established, and have every reason to feel good about the foundations you’ve already laid down. Look around you and take note of all you’ve accomplished thus far. Chances are good there’s a lot to be grateful for and a cause for celebration right there in front of you.